Since the Middle East was my area of specialization in academia, I'm sometimes frustrated at the mistaken or oversimplified ideas about the region which are common among Americans. From time to time I've tried to provide some background information to readers of this blog, as with this post on the Syrian conflict -- or to give a sense of the achievements and character of a civilization I believe Americans tend to underestimate, as with this post and this one, even if only visually. 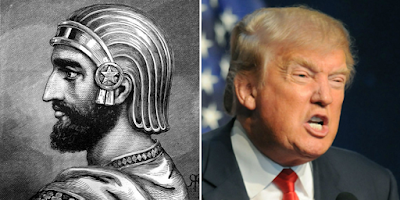 But nothing could have prepared me for the latest and most bizarre Middle-East-related idea to emerge from the sputtering synapses of the wingnut mind -- declaring Donald Trump a modern version of the ancient Persian ruler Cyrus the Great! The reason for this is clear enough. Evangelicals, stung by accusations of hypocrisy for their fervent support of a President whose personal life and morals are the polar opposite of what Christianity is supposed to stand for, reached for a Biblical analogy -- another case in which God used a ruler not of the True Faith for Godly purposes. Cyrus is briefly mentioned in the Old Testament because, after he conquered the Babylonian Empire, he released the Hebrews from their captivity there and helped them re-establish themselves in Israel. If God could use the non-Jewish Cyrus for this good end, he could use the not-very-Christian Trump in the same way, to deliver America from its current pagan nightmare of freedom and pluralism and refashion it into the Handmaid's Tale theocracy that good Evangelicals know it should be. But to anyone who knows history, the analogy is ludicrous. Cyrus the Great is one of the most fascinating figures in the long and complex history of the Middle East. (If you're not familiar with him, see my introductory post.) The founder of the first Persian Empire in the sixth century BC, he was in some ways a man ahead of his time. 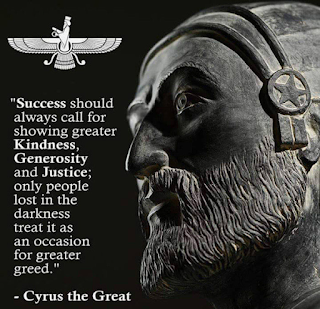 In contrast to the earlier Assyrians and Babylonians who used brutality to terrorize their subject peoples into submission, Cyrus usually (though not always) treated conquered nations humanely and with respect for their traditional cultures and forms of government, hoping that this would reconcile them to Persian rule. His empire was the first example of the type of giant multicultural universal state we associate with the later Romans. His benevolent treatment of the Hebrews was just one example of this policy. Also, Egypt was not incorporated into the Persian Empire in Cyrus's lifetime, so Israel was the Persian province bordering a powerful and potentially hostile foreign state. It made good political sense to have a grateful pro-Persian population living there. The contrast with Trump, who won and holds power by whipping up fear and hatred of cultural and ethnic groups different from the dominant American one, is rather stark. The religion of the Persian culture into which Cyrus was born was a kind of proto-Zoroastrianism in which drauga (lying) was the epitome of wickedness. Trump, of course, is not noted for his aversion to lying. Cyrus founded an empire which covered most of the Middle East and lasted 230 years; like the later Roman Empire, it maintained relative peace and facilitated economic and cultural interchange among dozens of peoples who had previously been isolated in small squabbling kingdoms and tribes. This allowed, for example, the spread of Babylonian science and mathematics to Greece, which helped stimulate the later explosion of Classical Greek science and philosophy. Trump is leading the US toward de facto isolation and fomenting conflict with other democratic nations which have been our allies for decades. He represents a political party which is trying to strangle and suppress science. Today, twenty-six centuries later, Cyrus the Great is still revered by millions in Iran for his character and achievements. It seems unlikely that Trump will command much respect 26 years from now, never mind 26 centuries. Mr. Trump, you're no Cyrus the Great. I'm pretty sure Cyrus didn't sign any Bibles either. Indeed -- even though, unlike Trump, he's at least mentioned in the Bible. Evangelicals will grasp at any nut-bar straw to justify their bigotry and naked right-wing self-interest. There is a shameless quality to Cult 45's attempts to make Trump seem like the answer to prophecy by finding parallels in Scripture or simply engaging in the tautology that he is in the White House because God willed it, answerable only by the evidence that there he is, in the White House. It's the kind of thing that makes me say "thank god I'm an atheist". But I wonder to what extent they would even acknowledge that to make these weird claims, they take the Lord's name in vain and frequently bear false witness to cover for his obvious transgressions and deficiencies? It isn't that Trump made them liars--the failing is how willing they are to lie to make Trump what he is not. The bold-faced cynicism of the religious right in America has no equivalent. Their thirst for power has made them anoint Cheeto with the mantle of 'savior' of their bigoted ways. The cognitive dissonance that affects their brain is not limited to themselves. It covers anything and everybody who would move their agenda of hatred ahead. BTW 'the sputtering synapses of the wingnut mind' is my rock band name of choice. This is the first I hear of Trump being compared to Cyrus the Great. What lunacy! Just when I think I've heard it all (eye roll). It seems to be getting crazier by the day. And I had no idea who Cyrus the Great was. This is what I like about your blog. It is very informative and very educational. The hierarchy for evangelicals is: Caucasian,authoritarian,Republican..."Christian." White identity is the first order, the desire for an authoritarian to protect that order, the Republican party being the vessel for that authoritarianism, the "Christianity" being the incantation to make the previous seem rightful and righteous. Debra: And like Maher says, the more nonsensical the better, since it shows "faith". Vixen: It shows that they're mostly concerned with power on Earth, not with what their supposed God thinks. Or they imagine he's as blind to hypocrisy as they are. Sixpence: Well, considering what they're trying to save, I guess Trump is the best savior they could get. He's from the bottom of the 50%-off everything-must-go savior clearance barrel. Martha: Thanks! I appreciate that. I wonder if Trump knows who Cyrus was. He may think they're comparing him to Miley Cyrus. Hackwhacker: I'd put "Christian" at the head of the list. Religion can be completely hypocritical and still be fanatical. They don't seem to have a problem with non-white people who are genuine right-wing religio-nutcases, like Ben Carson, but atheists and secularism come in for endless attacks. Even Trump has to pay clumsy lip service to religion (like signing Bibles), and the wingnuts feel the need to resort to ridiculous gimmicks like the Cyrus comparison to justify making an exception for him. Among all the other things that have been said about the fundagelicals' relationship with the Groper-in-Chief ... one that doesn't get much attention, but which might be the most powerful force attracting them to him, can be stated in one word: Immaturity. The GiC is unafraid to act like an raging toddler, and he does so often. Fundagelicals themselves tend overwhelmingly, also, to be rather childish. As a rule, religious fundamentalism (within any religious tradition) tends to appeal to immature people and it also tends to keep them immature, as well. What these folk see in the GiC is someone who behaves in ways they would, if they were in the same position (or so they imagine). Normally, such raging infantile behavior would be off-putting, even for people who're themselves childish. Couple this with the appearance of his success, though -- and there's a basis for that, given his many-years-long run as the "star" of a relatively popular reality TV series, if nothing else -- and the message they get is, "Hey, it's not always bad to act like a childish d-bag." Now, couple both of those factors with his willingness to go along with the fundagelical preachers' program, particularly by appointing Religious Rightists judges who, they hope, will overturn Roe v. Wade, and you end up with a powerful urge to ignore the GiC's decidedly un-Christian nature in favor of worshipping him. He represents what they admire, which is a combination of immature bombast, the illusion of "success," and a willingness to cater to them. It's something they can't resist, because it's even more alluring to them than others who've pandered to them over the years, e.g. G.W. Bush, the ex-fundagelical-in-chief who'd even gone to war for them, in the hope of invoking Armageddon. If you talk to them now, they'd tell you that the Younger Bush was an un-Christian poseur ... but they hadn't talked that way back in the 00s. He only appears that way, in hindsight and by comparison with the GiC. Yeah, they're pathetic. But that's not really news to anyone (like me!) who knows them. PsiCop: An insightful point. They do have immature traits, and there are good reasons why Trump is often compared to a toddler. Being in power, he's a bit like the terrifying brat in Jerome Bixby's "It's a Good Life". To be fair, I'm sure Trump has no idea who Cyrus the Great was...and if he did hear the name, he would ask whether it was a pro wrestler or a circus performer. I've always found most curious that as Alexander "the Great" was marginally Greek, being Macedonian, Cyrus "the Great" was only marginally Persian, being a Mede. It seems to be not uncommon. Think of Corsican Bonaparte and Georgian Stalin. The darkest example is the 20th Century über-German (who shall remain nameless) who, as an Austrian, wasn't even echt-Deutsch. And somehow Obama wasn't put in the White House by God. I assume they're thinking of Belshazzar's Feast in particular, which actually isn't so bad an analogy. You have to get past the misidentification of the actual Persian conqueror of Babylon, Cyrus the Great, as the "Darius the Mede" in Daniel, but the faith of the True Believers has overcome much greater obstacles. The basic narrative in Belshazzar's Feast is that the clueless rulers of the then greatest empire (also misidentified in Daniel) spend the night in drunken revelry despite the approaching Persian army, because they place their faith in the impregnable walls of Babylon. They become momentarily frightened when a hand unseen starts to write something on a wall of the banquet room, and call in Daniel to interpret the strange writing. But they fail to take Daniel's warning about the writing meaning that their empire has been weighed in the balance and found wanting, and return to mindless feasting and drinking. Meanwhile, even as they drink on, Cyrus has found a way into Babylon past its supposedly impregnable walls by, according to Herodotus, diverting the Euphrates into an already existing drainage canal, making the river so shallow that their army could march right in through the mostly dried river bed. This is the 2016 election, that all of the sophisticated people were confident that Hillary and the Ds couldn't lose. We were ready for a party on Election Night, but Trump pulled off the impossible and won. I don't care much for the idea that Trump is Cyrus the Great. Maybe if you subtract the work ethic, the intelligence, and the force of character of Cyrus the Great, what remains is sort of like Trump. But the idea that the Ds are like Belshazzar and his courtiers, that rings more true with me. We refuse to read the handwriting on the wall provided by the 2016 result, that our conventional wisdom about winning elections has been weighed in the balance and found wanting. Unless that conventional wisdom was completely wrong and useless, we should have won handily, because Trump was, by that "wisdom", the worst candidate running the most raucously incompetent campaign in the history of the republic. It was a miracle we lost and Trump won, if that conventional wisdom was correct. I know, I know. I've heard all the excuses. Trump didn't really win , because he lost the popular vote. It wasn't Trump, it was the Russian disinformation campaign. Our side won the House in 2018, so there's no need to worry about what 2016 was trying to tell us. These are all excuses. We're still refusing to read the handwriting on the wall. We're going to go into 2020 without learning a thing from 2016. Old Cyrus is gonna do it again unless we wake up and change the way we do politics. Marc: "Cyrus the Great is an example of somebody who's done an amazing job and is getting recognized more and more, I notice." Anon: Interesting point. Perhaps people whose sense of connection with their nation is a bit marginal become more nationalistic to compensate? Linus: They probably think the Devil did that while God wasn't looking. Glen: Well, not all those things are just excuses. Hillary really did win the popular vote, and there really was Russian meddling. Trump doesn't represent the will of the people in any sense. Many people think we should change the way we do politics -- the real question is in the details of how to change it. And the Democratic party is always going to be imperfect. It's made up of fallible humans and interest groups, after all. I enjoyed this, especially for the information on Cyrus the Great. History was never a topic of interest to me until a few years ago, and I've had a lot of catching up to do. Actually, I doubt that I'll ever be able to catch up, but I try. And as to your main point in the post, well done. Thanks! I've posted in some depth about Middle Eastern history from time to time, since it was my field. This analogy just struck me as especially obviously wacky.